I hope you’re all having a wonderful weekend. :) Just a quick card for ya tonight that I made with Stampin’ Up!’s new Ghostly Greetings paper and a stamp set from Schlosser Designs (I got two different sets at the same time and this is the other one). I love this color combo, too… Real Red, Kiwi Kiss, and Basic Black. It’s so… elemental? I can’t think of the right word. BTW, I used an Old Olive marker since there aren’t In Color markers. I’ve had the same question asked multiple times over the past couple days so I imagine many of you have the same query. Namely, how do I choose the top ten selection for the Color Inspiration Round-up? There is no formula or criteria for picking the top ten. It’s all gut instinct and personal taste. If I like it, I will pick it. So, what do I like? I like good craftsmanship (things glued on straight, clean cuts on the edges of card stock, etc), a good photo of the card (if you’re struggling with getting a good photo, take your card outside. Natural light is best), cards that show dimension, and basic good design (one focal point, good color combination, nothing too distracting). 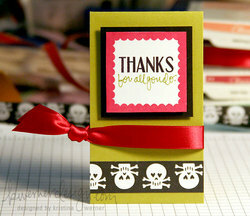 Thanks – Borders and Corners stamp set (Schlosser Designs); Kiwi Kiss, Basic Black, and Whisper White card stock, Ghostly Greetings Designer Series Paper, Real Red and Basic Black ink, Old Olive marker (Stampin’ Up! ); satin ribbon (Kate’s Paperie).